So big! Who do you want to hound to death? #SpringFestivalGala# During the Lunar New Year, spend lots of time with your parents. In a bit, remember to collect my red envelope. Happy New Year. In happy family news, singer Xianzi and actor Li Mao (previously of Top Combine) got married in mid-January! Xianzi has a few additional photoshoot pictures at her Weibo, while Li Mao also posted some really stunning photos on his Weibo. Congratulations to them! Actress Tong Liya and actor Chen Sicheng welcome their first child, whom they nicknamed Duo Duo, on January 30. 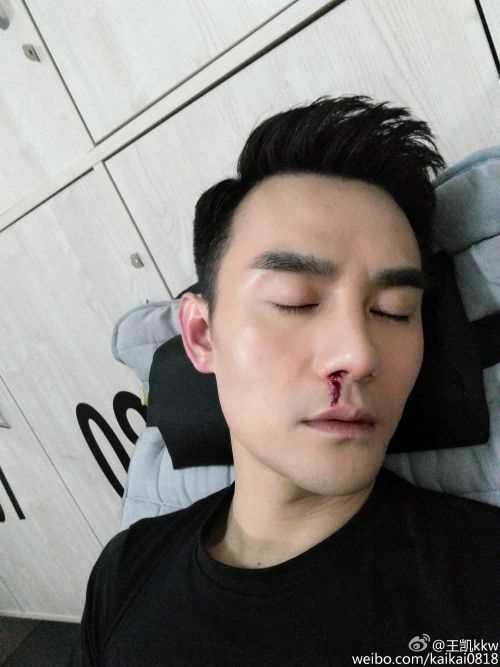 Although they didn’t specifically reveal the child’s gender, Chen Sicheng implied that it was a boy after saying that the two of them would be responsible for protecting Tong Liya now. 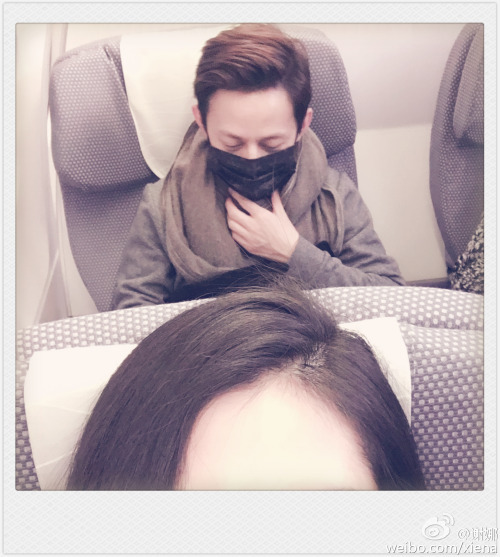 Xie Na tries to take a photo of herself and He Jiong on the plane, confirming all of our suspicions that the selfie-with-a-celeb struggle is real. 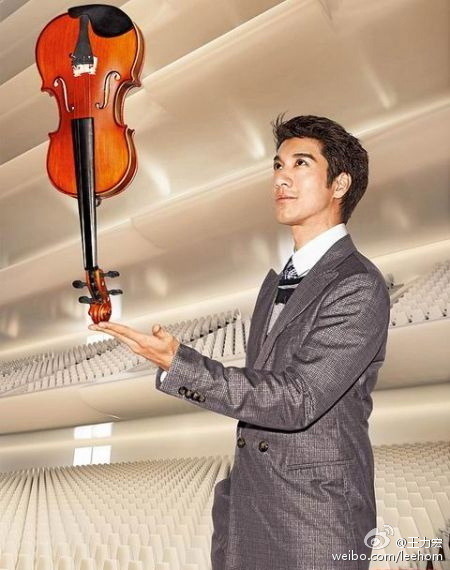 Wang Leehom shows off his violin-balancing act, while also posing a question for thought. 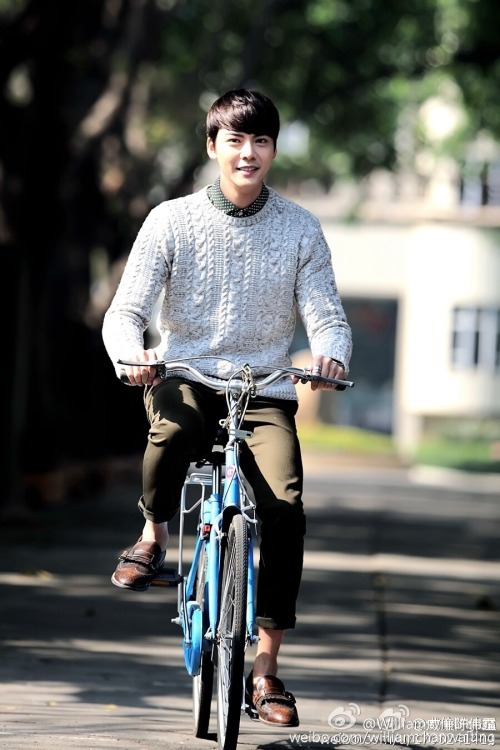 Exercising, eating vitamins, and posting on Weibo… what other things must one do every day? I wasn’t even looking at anything. How did I end up like this? 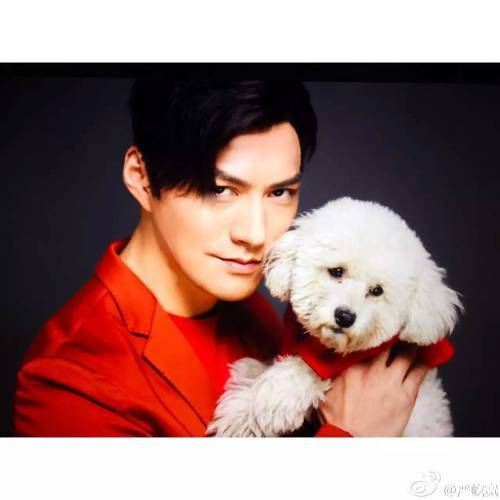 Yan Yikuan shows off his cute side by cuddling with an adorable puppy. His newest drama, New Xiao Shiyi Lang (also known by the dubious title Shaw Eleven Lang) began airing yesterday — has anyone checked it out? I have the first two episodes downloaded but haven’t had time to actually watch them. Give a meow! There’s still a traffic jam on the weekend. But everyone, don’t worry, the big red cat will continue maintaining everyone’s moods. Continue with work. I… don’t even know how to comment on this. 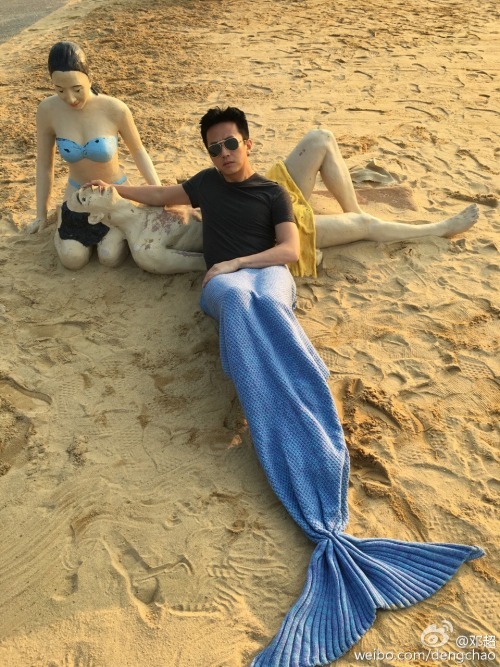 Deng Chao dressed up as a mermaid on the beach, tagging his new movie The Mermaid (美人鱼), directed by Stephen Chow. I guess that’s one way to do promotions LOL. The Mermaid opened in theaters on the first day of the New Year and has already set box office records, so I guess their promotional tactics are working. On February 2, William Chan injured his left leg when a motorcycle hit him on the set of Old Nine Gates (老九门), forcing him to cancel his performance in the CCTV Spring Festival Gala. The injury was diagnosed as an ankle ligament sprain. This is the second year in a row that William has been unable to perform during the Spring Festival Gala. Although he was disappointed at the turn of events, William still reassured fans that he is resting well and recovering. I’m sorry for letting everyone worry during this time. This is just a small accident; there’s no one to blame, and I don’t allow you to worry! I will eat up… and very fast I will be bouncing around in front of you! And some truly sobering news during the Chinese New Year season: a 6.4-magnitude earthquake hit southern Taiwan this past Saturday. At last count, 38 people have been killed, with more than 100 still unaccounted for. Please keep Taiwan in your thoughts and cherish your time with family during the holiday season. 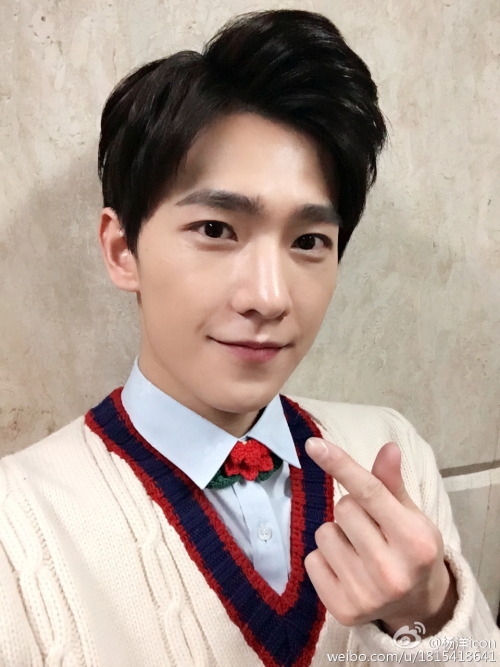 This entry was posted in Miscellaneous and tagged Chen Sicheng, Deng Chao, He Jiong, Li Mao, Old Nine Gates, Ruby Lin, The Mermaid, Tong Liya, Tong Tiexin, Wang Kai, Wang Leehom, Weibo Wednesday, William Chan, Xianzi, Xie Na, Yan Kuan, Yan Yikuan, Yang Yang by Jo. Bookmark the permalink. Happy Lunar New Year! Sorry to hear about the quake in Taiwan. Condolences to the families who lost their loved ones. May everyone be safe. For a moment, I mistook Leehom for Aarif Lee. and i mistook Deng Chao as Hawick Lau.. my bad lol. LOL! I guess this is the week of mistaking celebs for other celebs. There is some resemblance to Aarif in the photo, I have to admit.